This is the fourth in a series of six articles that looks at different aspects of excellent customer service and how it leads to increased overall profitability. The full series will be available for download as a white paper once it is completed. In our last article, we discussed 4 Steps to GIVE Exceptional Customer Service. Now we want to go over some of the key reasons why it is so important that customer service should be exceptional — to exceed expectations. 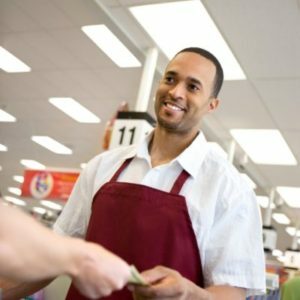 If customers are receiving exceptional customer service, they would naturally have a tendency to return to the same store again to fulfill future needs. Although the customer may only spend a small amount in any given transaction, their loyalty is potentially worth thousands of dollars in profits to the company — which helps secure future employment for the team. Therefore, exceeding customer’s expectations is in the best interest of all employees at all times. Here are 3 key reasons why investing in exceptional customer service is an investment in your long term success. Customer service should exceed expectations because it may be the only factor that separates you from your competitors. Your products and prices may be the same. Your hours of operation and location may be the same. The quality of your products may also be the same. So it’s the things you do differently that will make you stand out from other businesses in the eyes of your customers. Be different in as many positive ways as possible. Be memorable for the right reasons. Your team should be cheerful when dealing with all customers, no matter what sort of day they have had. Handle customer complaints in a positive manner. Make the effort to go the extra mile at every opportunity so people are more than satisfied with your service. They are so delighted with your service experience that they wouldn’t dream of going elsewhere. Your end goal should be to gain as many loyal customers as possible because they’re priceless. Exceeding their expectations on a regular basis is the best way to satisfy them and retain their loyalty. Customers don’t want the stress of looking for new places to shop. If you provide excellent customer service at every opportunity, they’re more likely to keep coming back because you’re making life easier for them. Loyal customers are much easier to service because they’re more forgiving if there are the occasional problems because generally they’re satisfied with your service. It’s five times harder to win a new customer than it is to service your existing customer base so it’s essential that your team builds long-lasting relationships with your customers so they do remain loyal. It’s easy to become complacent when dealing with loyal customers if they’re simply coming in and spending their money. It’s vital that your team remain ever-vigilant to customer needs. If your customer service experience exceeds expectations, that’s a powerful reason for customers to tell family and friends about your company’s service. People trust personal recommendations and are more likely to try a new business rather than go through the stress of shopping around for better prices. If the new customers are equally impressed with your service, they’re also more likely to refer you to their friends and so it continues like a domino effect, thereby increasing your profitability even more without excessive additional expenses. Even if you have a situation when a problem arises, this can be turned into an exceptional experience. This gives your team the opportunity to really demonstrate your service experience by the careful handling of the situation (more on this in our next article) and a positive result for the customer. Even then, any word of mouth advertising is bound to be positive. Word of mouth is the cheapest, yet most powerful form of advertising available. The faster it spreads, the better it is for your business. People will talk about your service experience — so it is important that the conversation is positive. Request permission for printable version of “3 Reasons Why Customer Service Should Exceed Expectations” for my customer service department.